Money Back From Amazon FBA! It isn’t safe to assume that FBA reimbursements and fees are always processed correctly. With so many sellers and so much inventory, mistakes happen. Refunds Manager recovers funds that would otherwise be lost. There are no monthly fees and no long-term commitments, meaning you have nothing to lose and everything to gain. Our professionals will find and locate your refunds, and when you get paid we earn a 25% commission. We've been in business over 5 years, and we know Amazon DOES NOT want automated claims. That's why we never automate the claims process. Our account auditors file all claims personally and manually for you. Returns: We reconcile every transaction on a per item basis. We make sure that the number of received orders and return reimbursements match up. Overages: We ensure that the customer is refunded exactly what they were initially charged. Damages: We look for items that were damaged by the inbound shipper. Replacements: We track when an item is replaced, ensuring that the original is returned. Return Policy: We track all orders to ensure they are returned before the 30 deadline. We make sure that Amazon has refunded your 20% restocking fee (per Amazon's policy) or the full amount. Missing Inventory: We find missing inventory (inventory that is debited but never returned after 45 days). Overage Fees: We ensure that you are not overcharged for weight or dimensional or Amazon commission fees. We always grant Amazon sufficient time to reimburse before opening a claim with them. We follow the right protocol for each individual case type. We NEVER automate correspondence with Amazon—every interaction is handled by your account auditor. After you sign up and sync your account, our software goes to work. 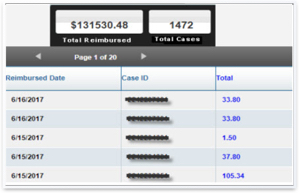 You can view any case inside Refunds Manager, and we’ll notify you as soon as reimbursements come through. Get started today and receive unexpected credits and reimbursements in your Amazon Seller account. Get Your Money Back From Amazon FBA!